SCL is represented on the Georgia Tech Savannah campus to serve as a resource for the coastal area. 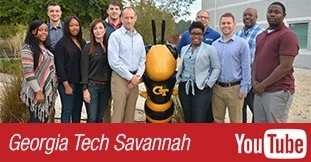 SCL is represented on the Georgia Tech-Savannah campus to support workforce development courses, online training, supply chain short courses and executive seminars. Additionally, our Savannah office serves as a mechanism for dialoguing with local businesses regarding challenges that can be addressed as student group projects or research engagements. A team from Georgia Tech joins data analysis effort for harbor’s expansion. Theresa Atkins, Director of Industry Partnerships with Georgia Tech-Savannah, discussed how they assist local businesses by providing them professional education. The Georgia Ports Authority, the Georgia Institute of Technology, and the Georgia Center of Innovation for Logistics signed a Memorandum of Understanding (MOU) at the Port of Savannah that creates a new relationship aimed at supporting the state’s logistics industry in economic development, research and education. A strategy to improve the flow of state, local and global trade goods got a boost Tuesday with the establishment of an official logistics partnership between the Georgia Ports Authority, Georgia Institute of Technology and Georgia Center of Innovation for Logistics. This year’s event attracted approximately 300 attendees and included a keynote panel discussion on Managing More for the Future. Panelists discussed topics such as managing infrastructure, technology, and workforce for more cargo, transparency, and expectations. 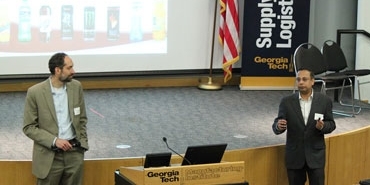 Theresa Atkins, director of industry partnerships at Georgia Tech-Savannah, describes her second year at the Georgia Logistics Summit and the strong presence of the Savannah logistics community. Access the video archive from the most recent Savannah Logistics Lunch and a podcast on "thoughts and predictions from the 2017 Georgia Logistics Summit"
As part of their 2017 Georgia Tour, Georgia Tech President Bud Peterson and Georgia Tech First Lady Val Peterson visited Colonel's Island RoRo terminal, one of nation's largest and most environmentally conscious auto facilities. Georgia Lieutenant Governor Casey Cagle discusses the connection between Savannah, Panama and Georgia Tech. More than 50 professionals from industry, government and academia participated in the first ever Georgia Tech-sponsored ports logistics conference. 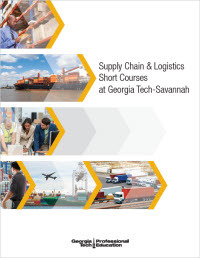 Thanks to the Georgia Tech-Savannah campus, coastal area supply chain and logistics professionals now have access to Georgia Tech's renowned curriculum. Below are courses we will be offering in Savannah for 2019. Click on a course name for details. To see all the courses we offer, please visit the full course listing. 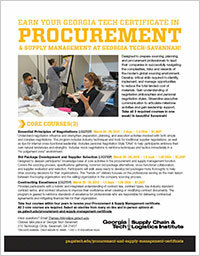 Are you in the Savannah area and interested in having us teach a supply chain and logistics related custom training course on the Georgia Tech Savannah campus or at a location of your choosing? Please use our contact form to let us know what you are specifically looking for. A one-of-a-kind training and transition program for active duty service members and veterans that translates military values into a successful civilian career. The Veterans Education Training and Transition Program (VET2) is a four-week program offered by Georgia Tech at no cost to service members. 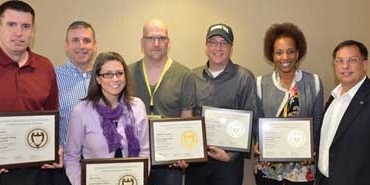 Specifically, SCL offers the VET² - Supply Chain Project Management Certificate Program. Collaborative partnerships have long been an important component of ISyE and SCL's philosophy. While we cover a wide spectrum of projects and research, there are two main approaches to working with us. You can work with our world-renowned faculty on a research project that focuses on a critical need or area of concern to help advance your organization’s goals, or you can work with a group of bright, intellectually curious undergraduate or master’s students and a faculty advisor within a capstone design class on a relevant company-specified problem. If you have questions relating to the below, please use our contact form to ask us about supply chain and logistics related research projects. Faculty regularly work with corporations and other organizations to perform in-context research that provides new knowledge, tools, and insights related to the immediate interest of our business partners. These projects are organized with individual faculty or small groups of faculty and may be structured as sponsored research, direct, consulting, or philanthropy depending on the type of desired partnerships. ISyE faculty members often have students participate in these research endeavors and this option type of project is preferred when results are needed very quickly or when the research questions are long-term and require deeper technical expertise. 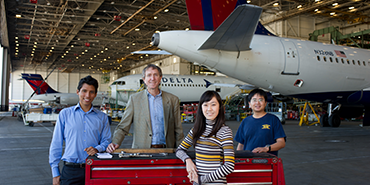 SCL supports faculty-led research through its Corporate Partnership Program. Contact us via our online form with questions. 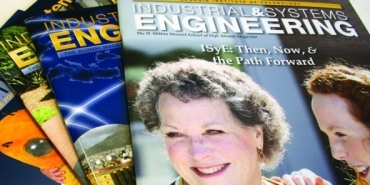 ISyE has three academic capstone design classes – Undergraduate Senior Design, MS in SCE Capstone, and MS in Analytics Capstone – in which students spend an intensive semester working on an engineering design project for a client company or other organization. These projects are designed to challenge and enhance the students’ problem-solving skills while training them to utilize all available resources to develop a solution for the project client. These programs offer a unique opportunity for your organization to partner and interact with these students, a win-win collaboration for both the students and your organization. Interpretation of specific aspects of the design problem and potential solutions will depend on each team's diverse range of skills, experiences, and imagination. Interested in having a team of talented undergraduate or master’s students tackle one of your pressing problems for their senior design or capstone industry projects? Contact us via our online form with questions. Partnerships with business and industry play a definitive role in guiding SCL's activities and direction. The result has proven to be mutually beneficial, with participating businesses enjoy incomparable opportunities for the professional development of top executives in critical areas, improvement to their operations through exposure to new ideas, and participation in problem-solving research projects they could not undertake on their own. From the university standpoint, the relationships keep educators and students apprised of the ever-changing business landscape, ensuring that their efforts remain in step with business world realities. Local Events During 2019, SCL will be involved in a number of local Savannah events. Please check back frequently to see what we have on our Savannah calendar. GTSCN Join the Georgia Tech Supply Chain Network, a professional and social group for alumni, students, faculty, staff, professional education students/alumni, and friends of Georgia Tech with an interest in Supply Chain. A new relationship aimed at supporting the state’s logistics industry in economic development, research and education.